Since ancient times, Japan’s inhabitants have lived in harmony with nature. However, major changes came to Japan due to land development during the high economic growth period and to the revolutions of fuels and fertilizers in the 1960s. The traditional relationships between humans and nature were disrupted, and biodiversity loss is emerging as a critical issue. Accordingly, in Japan, the conservation of local values and knowledge and the development and implementation of original methodologies are very much in demand. 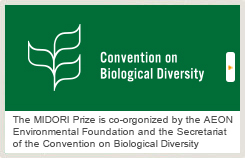 In order to work on this issue, AEON Environmental Foundation established the “The Japan Awards for Biodiversity” (domestic prize) in 2009, in commemoration of the tenth meeting of the Conference of the Parties to the Convention on Biological Diversity (COP10) in Nagoya, Japan. Since their establishment, the Awards have been conducted every two years, in odd-numbered years. The aim of the Awards is to honour five projects carried out by organizations or individuals in Japan that have made outstanding contributions and have had an impact on future activities for biodiversity, as the Grand Prix and four Excellence Awards. The Grand Prix recipient is awarded a certificate and a monetary prize of two million yen. Also, each Excellence Award recipient is awarded a certificate and a monetary prize of one million yen.